Carl Gottlieb Reissiger taught composition in Berlin, until he was appointed as Hofkapellmeister to succeed Weber in Dresden. He remained in this office until his death in 1859. Under Reissiger's direction, the Dresden Court Opera became world famous. In 1842 Reissiger conducted the premiere of Richard Wagner's 'Rienzi' and was involved in Wagner's appointment as second Kapellmeister after the premiere of 'Der Fliegender Holl�nder'. For over 30 years Reissiger was one of the musical magnates in central Germany, and along with Mendelssohn the most prominent Kapellmeister. 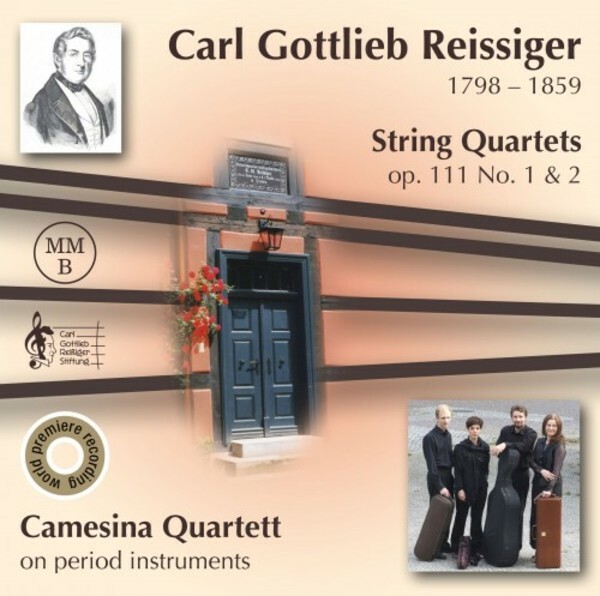 Reissiger's string quartets follow the classicist romantic tradition, not unlike that of Mendelssohn and Schumann. From time to time the influence of operatic music is perceptible, both the German tradition of his predecessor Weber, and the Italian tradition of Rossini and Donizetti, popular at the time in Dresden. There are clear reminiscences of Reissiger's idol Franz Schubert (as in the slow movement of the B minor quartet) and of his Leipzig colleague Felix Mendelssohn (as in the 'whispering' Scherzo of the A major quartet). Nonetheless Reissiger�s music has much individuality � the liaison of different styles is evidence of his cosmopolitan literacy. In a unique way he combines German and Italian stylistic qualities.